As you may know, I think that what we eat can really affect how we think, feel and react. Four years ago, I filmed a video here about mood-boosting and body-boosting foods and practices. Well worth a watch...if I am allowed to say that myself. I spent a lot of time researching the way our bodies process the nutrients and chemicals in foods, and the necessary vitamins we need to survive and thrive - and the impact of not getting enough. So, when Penguin sent me a proof copy of Dr Lisa Mosconi's new book about the neuroscience behind food, and how eating smart can sharpen your mind and improve your mental fitness - I READ IT. Dr Mosconi is a nutritionist and neuroscientist. She is also the Associate Director of the Alzheimer's Prevention Clinic of the Department of Neurology at Weill Cornell Medical College, and was the founder and director of the Nutrition and Brain Fitness Lab at New York University. She holds a dual PhD degree in Neuroscience and Nuclear Medicine from the University of Florence, and is a certified integrative nutritionist and a board-certified, holistic healthcare practitioner. So it's safe to say she knows what she's talking about...or writing about. 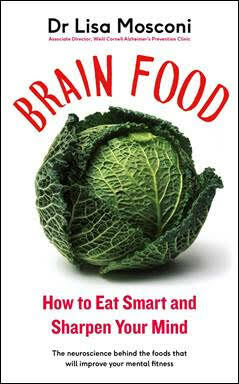 The book is chock-full of research-based information which highlights the connection between what we eat and how our brain works. But it's not all science and acronyms - there's some fantastic advice and loads of amazing recipes; consider it a one-stop-shop for all things brain-boosting! Does this sound like a book you want to read? If the answer is yes - then I have just the thing - a free copy of the book to give away. Penguin very kindly sent me a finished copy of the book, so that I could spread the knowledge! To win a copy of this book, all you have to do is follow Life In Recovery on Instagram (@lifeinrecovery_) and like the Instagram post announcing the giveaway. The winner will be picked at random and contacted privately to sort out delivery - the competition closes on Sunday 4th March. Unfortunately, this giveaway is limited to the UK.